How to watch Fight for Justice: David & Me (2015) on Netflix Netherlands! Sorry, Fight for Justice: David & Me is not available on Dutch Netflix, but you can unlock it right now in the Netherlands and start watching! With a few simple steps you can change your Netflix region to a country like USA and start watching American Netflix, which includes Fight for Justice: David & Me. We'll keep checking Netflix Netherlands for Fight for Justice: David & Me, and this page will be updated with any changes. Fight for Justice: David & Me is not available in Netherlands BUT it can be unlocked and viewed! After a convicted killer helps him turn his life around, a young filmmaker sets out to prove that his incarcerated friend is innocent of the crime. He's scrambling to get his innocent friend out of prison. He's got mounds of evidence, so why is nobody listening? There is a way to watch Fight for Justice: David & Me in the Netherlands, even though it isn't currently available on Netflix locally. What you need is a system that lets you change your Netflix country. With a few simple steps you can be watching Fight for Justice: David & Me and thousands of other titles! 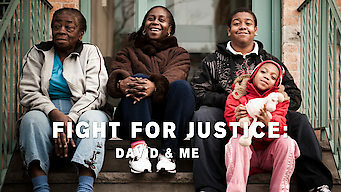 Watch "Fight for Justice: David & Me"